YouTube Videos, Click here for Independent Reviews. When you walk into our facility, or make a purchase online, know you are getting freshly made products that contain only fresh all hand picked ingredients. We create and pack our products in our own FDA registered processing facility. You will taste the difference. Our large assortment of all natural products include Arizona's Best Southwestern seasonings, meat rubs, salsas, sauces, hot sauces. They are a true taste of the southwest and are sure to please the home cook or restaurant chef. There is nothing in our ingredients that you wouldn't use yourself at home. Our flavors are bold so a little bit goes a long way. This is because we have no added chemicals, preservatives, fillers or MSG. And the salt? It's never a first ingredient except in our sea salts. You won't miss the salt or the chemicals. 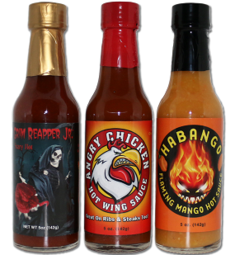 Choose from mild, spicy and Ghost Pepper or Scorpion Pepper Hot. Flavor first as we use nothing but the finest New Mexico Chile powders and chili to flavor our products. Our green and red chili powders come from Hatch New Mexico. For those that know this place, it doesn't get any better than Hatch chile. Check out our recipes page for BBQ ideas and a Southwestern chile family recipe and famous BBQ ribs recipe both made with Hatch NM red and green chile. Before you fire up the grill please browse our recipes. Custom Arizona gift baskets available any time of year. Christmas, Thanksgiving or corporate and personal gifts. Pick your own products or choose from our assortment listed online. All baskets are made fresh by hand so call ahead if you want to pick one up in person. Wholesale, retail, co packing and private labeling available. Corporate discounts on large orders. Please call or email for more information.